As a die-hard fan of Years and Years, I was amazed to see the marketing behind their new single, Sanctify. With all the talk of Facebook news feed changes and the adoption of chatbots into social marketing, their use of this medium was innovative and exciting. The campaign revolved around an advert which encouraged you to engage with their account on Facebook messenger. Instantly you are propelled into an Orwellian narrative being welcomed to the "PSEN Server" claiming to represent androids and non-humans. This was the first message users received. As the chat progresses, the story builds as Y&Y are portrayed as a "human collective" of rebels fighting against the authoritarian regime. Images of the symbol they used are sent to you along with 1984 style images and video clips. Its fun and intriguing and builds the anticipation of what is to come. The underlying message of "How to treat humans" underlies a lot of the themes Y&Y explore with their music, from LGBT rights to Human rights. Of course, all of this leads nicely to the release date of the single and on the day of release, more messages came through, finally inviting you to listen to the music or to watch the music video. This form of marketing really resonated with me. It was fun, intriguing and quirky and I enjoyed getting the messages. Real thought and planning had gone into the campaign and it did not feel like I was being marketed to. It felt like I belonged to the human collective, or at least that I identified with it. I do not know who the agency was behind this, or creative, but it bravo to them. 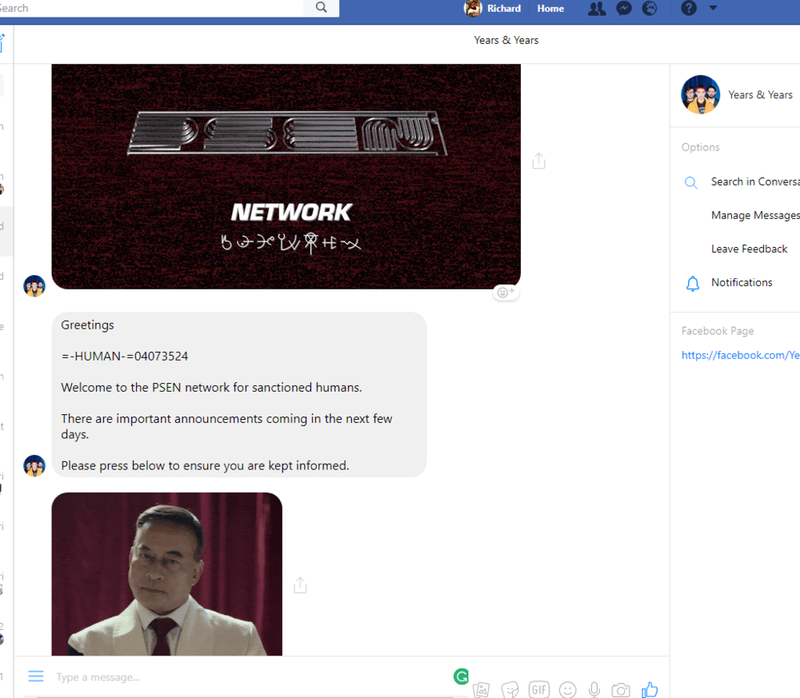 I look forward to more campaigns like this and it has certainly inspired us to think harder and more creatively about how we can use Facebook messenger and chatbots to better effect.